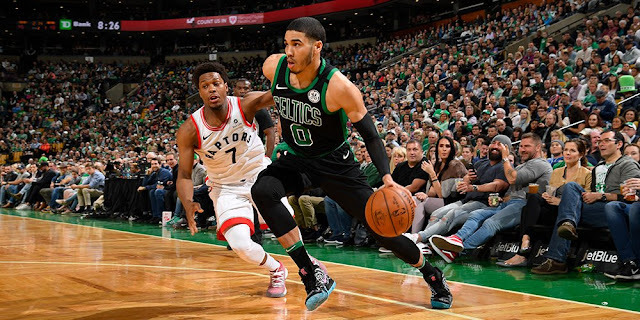 The Celtics hosted the Toronto Raptors on Saturday night for a bout between the top two teams in the Eastern Conference, and persevered through a tightly-contested and physical matchup before emerging victorious. The beginning of a competitive game was evident in the first quarter as the teams traded buckets to kick off the night. Around midway through the period, Aron Baynes decided to bury two consecutive three pointers virtually out of nowhere, and also added a few mid-range jumpers to increase his first-quarter scoring total to 12 points on 5/7 shooting. The Celtics Wire's Jared Weiss added some context on Bayne's history from outside the arc. Baynes' single other career three pointer also happens to have occurred in Boston, only not as a member of the Celtics. While the first quarter was a shootout, the second was something of a slugfest, with each squad totaling 22 each in the period. Nevertheless, both teams maintained high success rates from the field, and Al Horford manhandled Pascal Siakam on his way to the rack for an impressive bucket early in the quarter. In the third period, the game returned to the free-flowing offensive pace it displayed earlier as both teams ran up the scoreboard. Toronto had maintained a two-point lead by the start of the fourth quarter. The final period initially appeared to be more of the same until the midway point, at which point Boston completely took over behind tight defense and critical points from Terry Rozier, Jayson Tatum, Marcus Morris, and Al Horford. By the time the buzzer sounded, the Celtics had secured a 110-99 victory, but not before Marcus Morris was ejected after quite literally slapping an official's buttocks. I've attached a clip below because of course you want to see it. And here's those Baynes triples. Enjoy them for all their glory. DeMar DeRozan led all scorers with 32 points (12/19 FG, 8/10 FT). Shane Larkin (illness) joined Kyrie Irving, Marcus Smart, Daniel Theis, and Gordon Hayward on Boston's long list of scratches. The Celtics will now head to Milwaukee to face the Bucks on Tuesday night.